Follow the Isle of Eigg's 2012 archaeological dig through the team's daily on & off site news. After a week of digging and a day off we are back to work on the Sunday. We are particularly keen to have a look at the small enclosure that joins to the bottom of the large cemetery. Liz, one of the professional archaeologists on the excavation, believes that she can see an oval wall within this square enclosure. 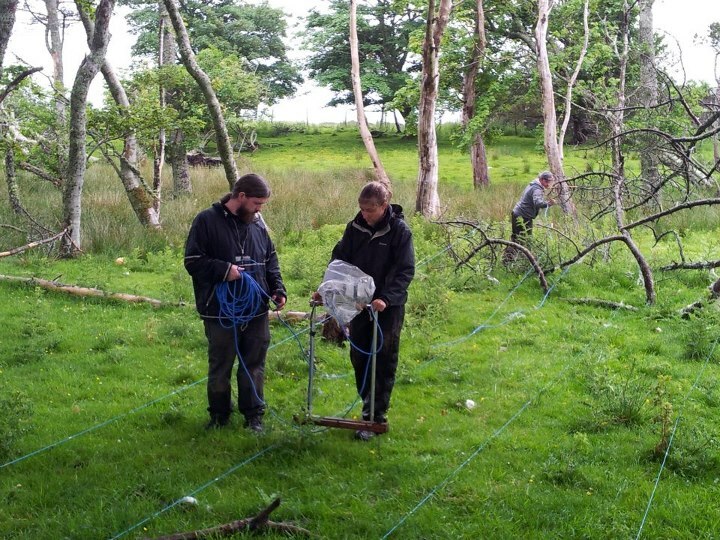 We want to get some dates from this area, so as well as some test trenches, we first want to get some geophysics undertaken – this will help us see where the graves are and if the oval structure underground is indeed a wall enclosure. First of all we have some wonderful islanders trim all the many thistles and nettles in this area which would make life miserable for us archaeologists. 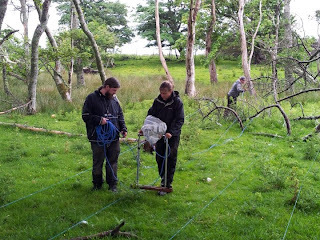 Once the thistles are cut we set up grids so that the geophysics machine can follow a measured path that we can put to our drawn plan or to a map. So over Sunday and Monday small teams helped to shift the machine up and down the grids at one metre intervals, making sure the long wires don’t get caught and they other members of the team don’t fall over the small tomb stones that are scattered around the cemetery. On the Monday some of the team prepare ideas for tomorrow’s visit from the local school children. We are really excited to show them what we have found in the trenches and to see if they can help us discover any interesting artefacts too. 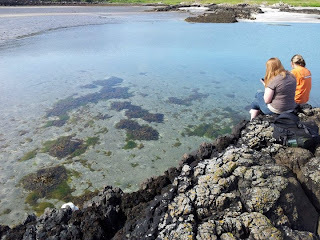 We have been really lucky too with the weather and it is yet another gorgeous sunny day – so much so we decided to take a trip down to the beautiful cove and beach near the site so that we can enjoy the sea for a bit. Check out how clear the sea is in our photo! This excavation blog is great! I really enjoy reading the different posts on this blog. Keep up the great work. I am going to be back to this blog soon. Great blog you've got here. I love going on my own trips to do earth moving in Brisbane. Do you happen to know of any good excavations companies in my area? Please let me know, thanks. Merci pour l'article. Je cherche un bon service d'excavation à Sherbrooke. Comment en choisir un?